Singer shared the news on her blog. 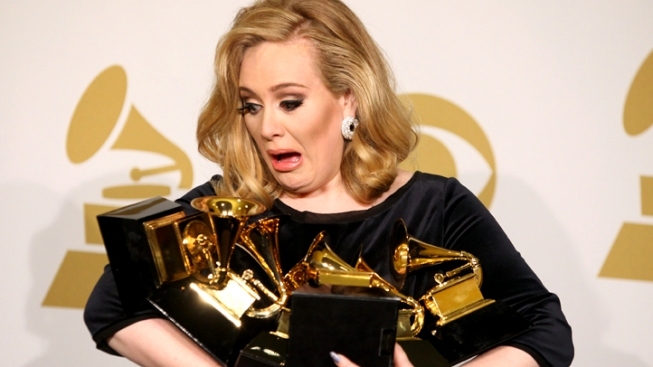 According to a post on her blog, Adele will have something else to hold in a few months. Multi-platinum recording artist Adele announced on her blog today that she is expecting her first child with boyfriend Simon Konecki. "I'm delighted to announce that Simon and I are expecting our first child together," she said in the post on her blog titled "I've Got Some News." "I wanted you to hear the news direct from me, obviously we’re over the moon and very excited but please respect our privacy at this precious time." Shortly after the news was made public, the British songstress' website crashed due to the heavy volume of traffic. It's unknown how far along she is. Ironically, Adele, 24, garnered mainstream pop culture superstardom and six Grammys for her breakthrough album, "21," which details the heartache of a relationship gone sour.